Funding for U.S.D.A export promotion programs including the Foreign Market Development Program and the Market Access Program. The conference report reauthorizes and fully funds these two critical programs, which have been essential to developing global markets for the hardwood industry. Loss of funding would be devastating. The Community Wood Energy Program (CWEP). The conference report increases the scope and authorization for this key program which will help create markets for hardwood sawmill residuals now accumulating at our manufacturing sites. Forest Management Reform measures, while not as extensive as we have advocated in the past would still help promote healthy management of our national forest lands, increased access for recreational activities, wildlife habitat development, reduction of forest fires, and economic health of the forest products industry. Reauthorization of the Farm Bill has been a key issue for the Hardwood Federation for the last three years. We will continue to work with key legislators to ensure proper implementation and continued funding for essential programs. Thank you to all of you that worked with your members and elected officials on this very important bill. 5 June 2018- Via Judy Petry, ASLRRA Chair: Linda has accepted a role as the CEO of another trade association beginning in August of this year. Chair Petry and Vice Chair Doc Claussen will convene the ASLRRA Committee this week to develop a fair and thorough process to select the next ASLRRA President. The course is titled "Preservative-Treated Wood: Specification and Use" and provides a detailed overview of preserved wood. It offers a review of the manufacturing process for pressure-treated wood; types of preservative treatments and required retention levels; service life expectancy; exposure conditions; and best management practices among other subjects. The course uses AWPA Use Category standards. The course meets the requirements of the Registered Continuing Education Program and will earn credit through the RCEP. May 3, 2018 Koppers News: Senior Vice President of Railroad Products and Services Tom Loadman, Retiring December 31st 2018. As of May 1, 2018, the RPS segment will be led by James A. Sullivan, SVP Global Carbon Materials and Chemicals. with Loadman taking on an advisory role to assist with the transition and other strategic projects aimed at indetifying potential growth opportunities for Koppers. Loadman has been with the company since 1979, serving in various management positions including Plant Manager, Railroad Plant Operations Manager, VP and General Manager RPS, and finally SVP, RPS in 2015. Sullivan joined Koppers in 2013 as VP of Business Development and in 2014, assumed responsibility of the global CMC business segment which has significantly transformed under his leadership. For the remainder of 2018, Koppers plans to evaluate whether this organizational realignment will change the way the financial performance is aggregated and assess the impact it may have on operational decision making. IF warranted, the company will report the results of any new business segments according to the applicable accounting standards and reporting requirements. May 18th, 2018 in Brewton, Alabama will be a day of educational opportunities. Lonza Wood Protection, in conjunction with The Alabama Extension Service, Escambia County Extension Office, is sponsoring a Wood Preservation and Safety Course. This course helps treaters maintain their CPAL certification in Alabama, and is open to anyone who would like to attend. There is no charge to attend. Contact Tim Carey if you are interested in attending. Information about the course and instructors can be found by clicking this link. 9 February 2018- The House and Senate passed the Bipartisan Budget Act, which the President signed into law. The credit is retroactive through December 31, 2017. The ASLRRA released a detailed statement about the tax credit which you can find at this link. The news story can be found in this Progressive Railroading article. Work remains to be done to make sure the tax credit is in place for 2018 and beyond. Be sure to join the ASLRRA at Railroad Day on the Hill to continue the conversation and urge lawmakers to consider making this beneficial tax credit permanent. The Federal Register, published on February 7th, has reclassified dual treated ties under the NHSM (Non-Hazardous Secondary Materials) rules. The entire ruling can be found in this PDF. This Crossties magazine article gives a summary and a link for more information. From the Treated Wood Council: The US Environmental Protection Agency and the US Army announced (https://www.epa.gov/wotus-rule ) plans to propose a rule to rescind the “waters of the United States” (WOTUS) rule. WOTUS, promulgated during the Obama administration, significantly expanded the waters of the US that would be regulated under the Clean Water Act. TWC will continue to work with our coalition partners on the proposed rule. For more information, contact Jeff Miller at the Treated Wood Council. The American Wood Protection Association is offering a Student Travel Fellowship Award which would enable a limited number of students to travel to AWPA’s 113th Annual Meeting, which takes place 09-11 April 2017 in Las Vegas, Nevada USA. At a minimum, the award covers transportation and lodging costs for each student selected to receive the award. Registration fees for selected students will also be waived. Each student receiving an award is required to present their research during the Annual Meeting. Students who are interested must submit an application form along with a brief abstract of their research. Applications will be judged and all students will be notified in January as to the result of their application. NOTE: The deadline for applications is Friday, 06 January 2017! May 13th, 2016 in Brewton, Alabama will be a day of educational opportunities. Arch Wood Protection, in conjunction with The Alabama Extension Service, Escambia County Extension Office, is sponsoring a Wood Preservation and Safety Course. This course helps treaters maintain their CPAL certification in Alabama, and is open to anyone who would like to attend. There is no charge to attend. Contact Tim Carey if you are interested in attending. Information about the course and instructors can be found by clicking this link. New projections released today by the U.S. Department of Transportation’s Bureau of Transportation Statistics (BTS) and Federal Highway Administration (FHWA) show that freight tons moving on the nation’s transportation network will grow 40 percent in the next three decades while the value of the freight will almost double, increasing by 92 percent. For more information, see the DOT website. The U.S. EPA has finalized an amendment to its nonhazardous secondary materials (NHSM) rule that will add three sources of fuel to its list of categorical nonwaste fuels, potentially making it easier for biomass energy facilities to make use of them. Under the Resource Conservation and Recovery Act, NHSM rulemakings identify which nonhazardous secondary materials are or aren’t solid wastes when burned in combustion units. If material is a solid waste under RCRA, a combustion unit burning it is required to meet the Clean Air Act Section 129 emission standards for solid waste incineration units. If the material is not a solid waste, combustion units are required to meet the CAA Section 112 emission standards for commercial, industrial, and institutional boilers, much less stringent standards. According to the EPA, the categorical listings make it easier to comply with the NHSM regulations, as facilities that generate or burn these NHSMs will not need to make individual determinations regarding their waste status. St. Louis, MO (December 16, 2015) – Scott McBride has been named Vice President of Procurement at Gross & Janes Co., Bill Behan has joined the company as Vice President of Plant Operations and Heather Bridges has been promoted to Controller. McBride has been with Gross & Janes for more than 30 years in a variety of roles, and has strong working relationships with sawmills that give him a deep understanding of their needs. He holds a Bachelor of Science in Business Administration in Accounting from the University of Missouri-Columbia and a Master in Business Administration from Webster University. Behan has 20 years of sawmill and plant supervision experience, including his recent operation of a large sawmill in Brookhaven, Mississippi. He holds a Bachelor of Science in Business Administration from St. Louis University. Heather joined Gross & Janes in 2009 and has helped strengthen the company’s accounting and financial management processes. She holds a Bachelor of Science in Accounting from University of Missouri – St. Louis and a Master of Business Administration with emphasis in accounting from St. Louis University. “These moves will help us maximize our productivity and capacity to meet the inventory needs of the Class 1 railroads in the coming months and years,” said Mike Pourney,” President and CEO of Gross & Janes Co.
Jacksonville, FL (October 27, 2015) – Shoreline Plastics, LLC, and Natural Wood Solutions, LLC have partnered together to develop the DUROSLEEVE™ Wood Protection System for industrial and residential wood applications. The new products will include utility poles, utility crossarms, railroad crossties, railroad bridge timbers and other various specialty wood products. Natural Wood Solutions, LLC is a leading provider of superior quality treated wood products and innovative wood protection systems. They specialize in providing durable, sustainable railroad crossties, switchties, roadcrossing panels and bridge ties and timbers. Shorelines Plastics, LLC is currently selling the Infinity Post Sleeve in select Home Depots located in Tampa and Orlando. Founded in 2006, this is the first time the company has sold their products in a national retailer. Shoreline Plastics specializes in PVC products that are used in challenging applications, and their patent-pending technology has gained popularity in the marine-pilings and fence post industries. About Shoreline Plastics, LLC: Based in Jacksonville, Fla., Shoreline Plastics, LLC is a manufacturer of PVC piping, profiles and flexible products. From pipe used in mining and other challenging applications to PVC bulkhead profiles used in structural applications, Shoreline Plastics has produced exceptional, durable products since 2006. Managing member, Mark Porter, has developed a patent-pending shrinkable product that has gained widespread acceptance in marine-piling and fence post applications. 26 Aug 2015 The Board of Governors of the American Railway Engineering and Maintenance-of-Way Association (AREMA) has appointed Elizabeth (Beth) S. Caruso, CAE, as Executive Director/CEO, effective Sept. 1, 2015. Caruso joined AREMA in May 1999 and most recently served as Director of Administration. She holds a BA degree in English with a concentration in Media Communications from High Point University in North Carolina. She is a member of the American Society of Association Executives (ASAE) and has earned her Certified Association Executive (CAE) designation. Caruso resides in Maryland with her husband Chris and two children. “Now that Beth Caruso is our new Executive Director, she will make the changes necessary to ensure AREMA fulfills its mission—‘the development and advancement of both technical and practical knowledge and recommended practices pertaining to the design, construction and maintenance of railway infrastructure’—and ensure it is run with the utmost professionalism and integrity,” said AREMA President Randy Bowman. 2 April 2015 Rockford, TN – Nisus Corporation announced today that Ken Laughlin has been promoted to Divisional Vice President of Nisus Corporation’s Wood Preservation Division. “Laughlin has made a significant impact for Nisus Corporation since joining the company in February of last year,” says Kevin L. Kirkland, President and CEO of Nisus Corporation. “Ken’s knowledge of the wood preservation industry and his expertise on copper naphthenate have been invaluable helping Nisus effectively build QNAP® copper naphthenate into a solid brand in the marketplace.” Laughlin supports the company’s sales of QNAP copper naphthenate and Cellutreat® DOT borate to the pressure treatment market and works with end-users as well as pressure treatment companies to incorporate these treatments into their regimes. Laughlin is a graduate of West Virginia University with a B.S. in Forest Management. Prior to his position with Nisus, he worked for Pacific Wood Preserving Companies and Burke, Parsons-Bowlby Corporation. The treated Wood Council has scored a win with the removal of language unfavorable to the treated wood industry. Last year, The Treated Wood Council asked the Corps of Engineers New England District Office to remove the language in the Massachusetts General Permit restricting the use of CCA and creosote treated wood. The Office has removed that language and has substituted the following language: "No activity may use unsuitable material (e.g., trash, debris, car bodies, asphalt, etc). Material used for construction or discharged must be free from toxic pollutants in toxic amounts (see Section 307 of the Clean Water Act). "Since the EPA has determined that the use of FIFRA-registerd wood preservatives according to the pesticide label does not constitute an unreasonable risk to human health or the environment (therefore not "in a toxic amount"), the new language gives us the opportunity to use treated wood under the General Permit. Right now, railway ties are recycled in a number of innovative ways at facilities in Canada and the US to produce energy in the forest products sector. In May 2013 Lafarge Canada teamed up with Natural Resources Canada, The Queen's Institute for Energy and Environmental Policy, and Carbon Management Canada to launch an $8 million project to power its Bath plant with surplus materials such as railway ties supplied by CN. The Bath initiative will result in the most comprehensive testing ever done in Canada around fuel substitution. This initiative could reduce CO2 emissions by upwards of 400,000 tonnes a year. Lafarge is looking at the entire lifecycle to quantify the environmental benefits of substitute fuels with a focus on demonstrating that these fuels emit less CO2 than coal and petroleum coke. Canadian National Railways is supplying the ties with Rail Link providing the off-loading and chipping services before supplying the burnable fuel to Lafarge. April 24th, 2015 in Brewton, Alabama will be a day of educational opportunities. Arch Wood Protection, in conjunction with The Alabama Extension Service, Escambia County Extension Office, is sponsoring a Wood Preservation and Safety Course. This course helps treaters maintain their CPAL certification in Alabama, and is open to anyone who would like to attend. There is no charge to attend. Contact Tim Carey if you are interested in attending. Tacoma, WA February 23, 2015 — Northwest Hardwoods Inc. (NWH) has recently completed the acquisition of Industrial Timber & Lumber Company (ITL) based in Beachwood, Ohio. NWH is headquartered in Tacoma, WA and has operations in the United States, Canada, China, and Japan. ITL is one of the largest global suppliers of North American hardwood. It sells over 200 million board feet of high quality hardwood lumber annually and has approximately 400 employees. ITL owns two integrated sawmills, four concentration yards and one dedicated service center with operations in Ohio, West Virginia, North Carolina and Pennsylvania. “We couldn’t be more pleased to acquire a great company like ITL to better serve our customers. NWH is adding a business with highly motivated and experienced employees, outstanding quality products, highly automated and efficient mills, and an attractive worldwide customer base that relies on ITL for essential products and industry leading customer service. The highly respected ITL brand name is the perfect compliment to the NWH brand which has been recognized as the ‘Gold Standard’ for hardwood for nearly 45 years,” said TJ Rosengarth, President and CEO for NWH. “Our employees are very excited about this combination of two great companies. Our customers have grown accustomed to the high quality products and industry leading service model that ITL provides. This combination with NWH will allow us to better serve those customers with an even wider array of products” said Larry Evans, President of ITL who will continue to lead the ITL organization for NWH as it operates as a wholly owned subsidiary of NWH. Northwest Hardwoods, Inc., with approximately 1,600 employees, is the leading manufacturer of high quality hardwood lumber in North America. It manufactures and sells 15 species of hardwood lumber, including Alder, Oak, Maple, Cherry, Yellow Poplar and Walnut. Operations include a network of fifteen primary sawmills, five concentration yards, one remanufacturing plant and regional warehouse locations. The combined companies carry the broadest selection of products available to the industry making us the preferred supplier for all their product needs. A one day mini-conference on converting the "mountain" of inspection data collected by railway systems into effective maintenance planning information to be held at the University of Delaware in Newark, Delaware on December 9th 2014 from 8 am to 5 pm. Co-Chairs are Dr. Allan Zarembski, University of Delaware; Nii Attoh-Okine, University of Delaware; and Joe Palese, Harsco Rail.There is no cost associated with this conference, but you must preregister by contacting [email protected]. September 12, 2014 Washington DC The NRC announced 17 rail-related projects are slated to receive funding from this year's TIGER VI grant program. For a list of funded rail-related projects click here. For a list of all TIGER VI grant projects, visit the US DOT website. To for more information click here to see the jobs page at CSX's website. April 11th, 2014 in Brewton, Alabama will be a day of educational opportunities. Arch Wood Protection, in conjunction with The Alabama Extension Service, Escambia County Extension Office, is sponsoring a Wood Preservation and Safety Course. Click here for more information and a detailed agenda. This course helps treaters maintain their CPAL certification in Alabama, and is open to anyone who would like to attend. There is no charge to attend. Contact Tim Carey if you are interested in attending. Washington DC 13 March 2014 The Treated Wood Council (TWC) reports that the Office of Management & Budget (OMB) has cleared a proposal to expand the list of materials designated as “non-hazardous secondary materials” eligible to be boiler fuels. On March 13th, Inside the EPA mentioned the report stating that the proposed rule has been sent back to EPA for signature and publication in the Federal Register. Our understanding is that the EPA’s (and industry’s) proposal to include creosote treated railroad ties is included in the listing. Then coalition of many associations over the past few years working on this issue, AAR, Creosote Council, RTA and TWC and others along with their members input has once again shown that there is strength in numbers especially when we speak with a unified voice. More updates to follow as we learn of the Administrator’s action and any publication in the Federal Register. In June 2014, the Railway Tie Association (RTA) and the Rail Transportation and Engineering Center (RailTEC) at the University of Illinois at Urbana-Champaign (UIUC) will host joint activities that will provide educational and networking opportunities relating to crossties and fastening systems. These events are expected to draw domestic and international attendees that include rail infrastructure component designers, manufacturers, researchers, and end users such as Class I’s and transit operators. Thanks to Railway age for this informative article. See the full story from Railway Age here. 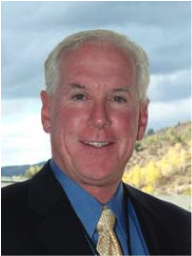 Rockford, TN – Nisus Corporation announced today that Ken Laughlin, formerly with Pacific Wood Preserving Companies, has joined Nisus and will support the company’s sales of QNAP® copper naphthenate and Cellutreat® DOT borate to the pressure treatment market. Laughlin will work with end-users as well as pressure treatment companies to incorporate these treatments into their regimes. Laughlin is a graduate of West Virginia University with a B.S. in Forest Management. Prior to his position with Pacific Wood, he worked for Burke, Parsons-­‐Bowlby Corporation where he started as an inventory clerk in 1974 and worked his way up to Division Manager. In 1988 Laughlin began as Pacific Wood's General Manager in charge of Arizona and Texas. 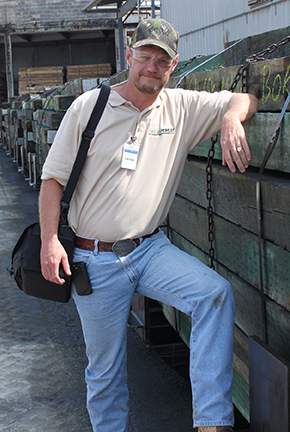 He was promoted to Executive Vice President of Sales and Operation in March 2013 and to President of West Coast Wood Preserving in November 2013. Laughlin is Past President of RTA and has served on the board twice. He served as the Vice Chair of T­-3 of the American Wood Protection Association (AWPA) and sat on the San Carlos Sawmill Board. He also served as the AWPA President in 2013. Matt Ginsberg, most recently Director of Operations, will serve as the Vice President of Regulatory and Legislative Affairs. Matt will assist in the execution of NRC's legislative agenda and serve as the lead on safety issues for the NRC. Ashley Bosch, most recently Operations Manager, will serve as the Vice President of Grassroots Advocacy and Events. Ashley will plan and coordinate visits from Members of Congress to NRC member facilities and work sites, and will assist with government affairs efforts. She will continue to be the lead planner of the NRC Conference and other NRC events. Alice Post will serve as the Director of Operations and will provide assistance to NRC members regarding all administrative matters, membership issues, event registrations, and directory listings. She will communicate to you regularly via email bulletin, updating you on the latest important news in the rail construction and maintenance industry. Many of you had a chance to meet Alice at the recent NRC Conference in Palm Desert, CA. Chuck Baker remains in his role as President of the Association. Click this link for the detailed announcement for the AWPA Student Poster Competition. The competition will be held on Monday, May 5, 2014. The winner of the competition will receive $1000 and the runner-up will receive $500. RTA expresses sadness at the passing of John Hunsberger, RTA member and long-time supporter. John Hunsberger II, Manager of Sales and a 23 year Pandrol employee died at his home on january 10th. Hunsberger was "highly respected" at the company and throughout the industry. He was a member of the New England Rail Road Club. He is survived by his wife, Clare and a son and daughter. 8 January 2014 PITTSBURGH, PA- Koppers Inc., a wholly-owned subsidiary of Koppers Holdings Inc. (NYSE: KOP), announced that it has signed an Asset Purchase Agreement to acquire the crosstie treating business and related manufacturing facility of Tolko Industries Ltd. (Tolko) located inAshcroft, British Columbia, Canada. The proposed transaction between Koppers and Tolko is subject to certain closing conditions. Koppers expects the acquisition to close within 30 days with the purchase price being funded primarily by cash on hand. Walt Turner, President and CEO of Koppers, said, "The acquisition of Tolko's Ashcroft crosstie treating business strengthens our presence in the Canadian railroad industry as well as the northwest region of the United States. This transaction fits well with our strategic growth plan for our railroad products and services business in North America as we continue to build on our commitment of providing quality products and services to the railroad industry." 15 July 2013 - The Association of American Railroads Associate Advisory Board has selected Joseph W. Palese from Harsco Rail to serve out the remainder of the term of a vacant seat on the TTCI Research Advisory Board. Palese’s term of service will last until Jan. 1, 2014. PITTSBURGH, PA, December 2, 2013 –Koppers Inc. announced the following personnel changes to its Railroad and Utility Products and Services Division’s Sales and Marketing group for the Southeastern United States. John Stahl, Sales Manager for the Southeast Region, will retire from Koppers on December 31, 2013. During Mr. Stahl’s stellar 41 year career with Koppers, he worked in various key positions, both in operations and sales at the company’s locations in Georgia, Pennsylvania, South Carolina, and Texas. Jamie Skipper has been appointed as the new Sales Manager for Koppers Southeastern Region. Mr. Skipper started with Koppers in 2004 as a Pole Yard Supervisor at the company’s Florence, South Carolina facility. In 2007, he took on the role of the CSX Transportation account as Logistics Coordinator for Koppers. Mr. Skipper will continue to be based out of the Jacksonville, Florida area for his position. 2 December 2013 - The International Code Council Evaluation Service has recently announced a new labeling procedure for identifying treated wood sawn products in compliance with the International Building Code and International Residential Code. This action will likely pertain to building code compliance. Details are available here. For more information contact Jeff Miller of the Treated Wood Council. St. Louis, Mo., November 25, 2013 – Gross & Janes Co. has begun construction of a new $2.2 million railroad crosstie production and borate treatment facility in Camden, Arkansas. The new facility will replace an existing Gross & Janes crosstie plant in Camden and also consolidate production from two other company plants in Taylor, Arkansas and Carthage, Texas. When fully operational after its scheduled completion in March 2014, the new plant will employ 15 people and have the capacity to produce 600,000 crossties annually. Most crossties processed at the new Camden facility will be Gross & Janes’ borate pre-treated crossties called Tuff-Tie®. This green crosstie is treated with borate using an innovative non-pressurized process prior to drying and shipping to the customer for creosote treatment. This ‘two-step’ treatment process eliminates the cost of pressurized application of borate at the time of creosote application, while also offsetting the amount of oil-based creosote needed for tie protection. The result is a tie with enhanced environmental benefits including less creosote utilization and more environmentally friendly alternatives for the disposal of spent ties. When the new Camden facility opens, the Carthage plant will remain open as a railcar loading facility and the Taylor plant will close. All employees have been offered employment at the new Camden facility. Gross & Janes Co. is the largest independent supplier and shipper of untreated railroad crossties in North America. Founded in 1920, privately held Gross & Janes has production facilities in Missouri, Mississippi, Arkansas, Texas and Alabama. The company serves Class 1 railroads and track maintenance contractors with high quality green and borate pre-treated crossties, and purchases raw material from more than 225 independent sawmills located in ten states. For more information, visit www.grossjanes.com. On Wednesday, November 13, 2013 the USDA released for comment the proposed Hardwood Lumber and Hardwood Plywood Promotion, Research and Information Order. Comments must be received by January 13, 2014. To review the Order, follow this link. The program would be financed by an assessment on hardwood lumber manufacturers and hardwood plywood manufacturers and would be administered by a board of industry members selected by the Secretary of Agriculture. The assessment rate varies according to the product manufactured. The purpose of the program would be to strengthen the position of hardwood lumber and hardwood plywood in the marketplace and maintain and expand markets for hardwood lumber and hardwood plywood. A referendum would be held among eligible hardwood lumber manufacturers and hardwood plywood manufacturers to determine whether they favor implementation of the program prior to it going into effect. Interested persons are invited to submit written comments concerning this proposal until January 13, 2014! Comments may be submitted online here. All comments should reference the docket number and the date and page number of this issue of the Federal Register and will be made available for public inspection, including name and address, if provided, in the above office during regular business hours or it can be viewed here. For more information visit the Hardwood Check Off Website. For more information visit the Hardwood Federation's website. A proposed rule listing creosote treated rail ties as a "non-waste fuel" is pending at the Office of Management Budget for review. Although the rule under review-the Nonhazardous Secondary Material rule-is positive in that it lists these ties as fuels, the industry is concerned about language in the proposed rule that would precondition combustion of rail ties to only those boilers that are "designed to burn" a comparable fuel. In the case of rail ties, a comparable fuel is fuel oil, which requires that boilers be equipped with nozzles and multi-fuel burners. The problem is that many boiler owners have eliminated nozzles since they no longer use oil as a start-up fuel. Thus, there is concern that retention of this language would unnecessarily restrict use of rail ties as a fuel source. A Congressional letter to OMB is circulating in the House led by Representatives Michaud, Ribble, McKinley and Schrader to underscore the importance of the final rule having an expansive, practical definition of fuels to ensure these materials are utilized. Senator Mary Landrieu may be sending a separate but similar letter on the issue. The Hardwood Federation is working with our allies in recruiting signatories to the House letter. So far 14 Members of Congress have agreed to lend their names to the letter. For those of you who are NCFAE members, Jennifer Boccarossa, beloved daughter of Arkansas Timber Producers Association Executive Director Larry Boccarossa and his wife, Patti, suffered a stroke over the weekend and passed away yesterday. A singer and music teacher, Jennifer was only 30 years old and was the mother of a young son, the light of his grandparents’ eyes. Please join us in offering the Boccarossa family support and prayers, during this difficult time. The Board of Directors of Georgetown Rail Equipment Company is very proud to announce the election of Mr. Christopher (Chris) Aadnesen to the position of Executive Chairman of GREX. Mr. Aadnesen who recently retired as President & CEO of the Alaska Railroad Corporation brings more than 40 years of experience in the railroad industry to GREX, and his knowledge and ability will bring invaluable experience to the GREX Staff. Mr. William “Wiggie” Shell, who will continue to serve as President and CEO of GREX, stated “We are very fortunate to have someone of Aadnesen’ s caliber join our team here at GREX.” Mr. Aadnesen was the previous Chairman of the GREX Board from 2007-2010. Special Alert: The National Hardwood Lumber Association Kiln Drying Certificate Has Been Approved For the European Union. All oak species- Quercus sp. The EU has stated that there will be a 60 day period to translate all documents needed to distribute to the various EU countries prior to accepting initial shipments using the NHLA Kiln Drying Certificate. For more information click here. The United States Trade Representative (USTR) has requested that the U.S. International Trade Commission (USITC) study to catalogue issues and experiences that small and medium sized businesses (SMEs) are having in exporting to the EU. Of particular interest are any non-tariff measures that disproportionately affect the ability of SMEs to export. Al Goetzl of USTR has reached out to me, Mike Snow and several other Hardwood industry associations to solicit comments for the study. I have been in touch with NHLA and two potential issues were identified: Recognition of the KD Certificate Program and regulatory issues related to exporting ash. If you have any additional thoughts regarding comments that may be submitted through the Hardwood Federation, please let me know by September 20. Written comments are due on October 15.
RJ Corman president Craig King announced the passing of Rick Corman Friday morning. Corman battled myeloma for 12 years prior to his death. Read the full in memoriam piece in Progressive Railroading. See the special edition of Views & News about the FRA ruling in wake of the Lac Megantic accident along with recommendations from the ASLRRA. On August 7, Rep. Shelley Moore Capito (R-WV) joined representatives from the National Railroad Construction and Maintenance Association (NRC) for a tour of the Appalachian Timber Services facility in Sutton, W.Va.
As a member of the Committee on Transportation & Infrastructure's subcommittee on Railroads, Pipelines and Hazardous Materials, Rep. Capito helps oversee the economic and safety regulation of the railroad industry. Appalachian Timber Services employs 49 people and has been servicing the railroad industry for more than 40 years with creosote treated wood products. Capito joined Appalachian Timber executives for an introduction and briefing, followed by a tour of the rail tie plant. Appalachian Timber specializes in timber products, crossties and services for the railroad industry. Customers include shortline railroads and transit agencies all over the eastern United States. "It was an honor to meet with the NRC and tour the Appalachian Timber Services facility," said Rep. Capito. "Companies like Appalachian Timber Services play an integral role in West Virginia's economy. Not only do they create jobs, but they keep our railroad industry moving." On Aug 6, 2013 Mitek sent the following press release: MiTek Industries, Inc. (Chesterfield, MO) announced today that its Hohmann & Barnard, Inc. subsidiary (Hauppauge, NY) had completed the purchase of the assets of Astoria, NYbased RKL Building Specialties Company. away in College Point, Queens, NY." On July 30, 2013 MiTek sent the following press release: MiTek Industries, the world’s leading supplier of advanced engineered structural connector systems, equipment, software and services for the building components industry announced today that it has acquired Benson Industries, LLC. Benson is the global leader in the design, pre-fabrication and installation of custom unitized curtain wall systems for high-end commercial, hotel, residential, governmental, and institutional buildings worldwide. MiTek is a subsidiary of Warren Buffett’s Berkshire Hathaway Inc.
“The acquisition of Benson extends MiTek’s product offering into the global high-rise commercial building construction market. Benson is a terrific addition to the MiTek family,” stated Tom Manenti, Chairman and CEO of MiTek. “Lou Niles will continue to serve as Chief Executive Officer of Benson, along with Joe Aholt as Chief Operating Officer. The entire Benson management team will remain, and continue to lead the company. Benson will operate as a separate subsidiary of MiTek,” Manenti commented. MiTek is based in Chesterfield, Missouri and is a diversified global supplier of engineered products, software and systems to the construction industry. The company has operations in over forty countries on six continents and has been a Berkshire Hathaway company since 2001. Mr. John T. Jones of the Animal and Plant Health Inspection Service agency of the USDA clarified the recent Mexican phytosanitary regulations concerning creosote treated wood crossties with the following statement: "Mexico did not mention any changes to Creosote treated crossties in their NOM nor during our discussions. There has been no change to your product." For more information, see the article below dated July 3, 2013. Stockholm, Sweden – Dr Jeff Lloyd, Corporate Vice President of Research and Development at Nisus Corporation, has been appointed President of the International Research Group on Wood Protection (IRGWP). The appointment lasts for three years, was preceded by a three-year vice presidency and is followed by three years as Past President. The appointment was announced at the organization’s annual conference held this year in Stockholm, Sweden. IRGWP is an international non-profit group that focuses on the latest developments and research in wood protection by providing the opportunity to develop and foster interaction between scientists from all over the world. It does this principally through its annual and regional conferences as well as working with different bodies active in the field. The annual meeting is hosted by a different country every year (Malaysia last year and the USA next year). IRGWP has now been meeting for more than 40 years and has members representing more than 50 countries. Dr. Lloyd has more than 20 years of experience in preservation, pest control and forest pathology research, technical service and global market development. He holds degrees in Applied Biology and Microbiology as well as a Ph.D. in Biochemistry/Preservation Technology from Imperial College at The University of London, England. He has authored numerous scientific publications and is a member of several industry and scientific organizations, including the American Wood Protection Association and the Railroad Tie Association, and is a fellow of the Institute of Wood Science. Dr. Lloyd holds several patents, including patents on the use of calcium borate to protect wood composites and the use of borates on concrete as a termite barrier. For more information on IRGWP, visit their website. As I am sure most of you are aware, there has been much confusion in recent days over stepped-up enforcement of Mexican phytosanitary regulations. While there is much that is still being negotiated between the US Government and Mexican authorities on exact interpretations and definitions, what has become clear is that until further notice Mexico will be requiring that a phytosanitary certificate accompany all lumber shipments beginning on July 2, 2013. Furthermore, the certificate MUST contain the additional declaration that “lumber of this consignment is bark free, oven-dried, and free of quarantine pests”. This will obviously create some significant issues, particularly with the large quantities of lower grade lumber that makes up a significant portion of US exports to Mexico. We have been in contact with APHIS officials both in Washington and in Mexico City, and they have advised that US exporters can keep track of any updates on the issue through the Mexico page of the USDA “Phytosanitary Export Databse” (PExD) which can be accessed through the “Phytosanitary Certificate Issuing and Tracking System” (PCIT) on the USDA website. AHEC is working with the Mexican Forest Products Import/Export Association (IMEXFOR) to clarify the situation. We are also engaging the importers and furniture manufacturers in Mexico to be sure they understand what strict interpretation of this regulation will do to their supplies and costs. We are urging them to make their concerns known to the Mexican government. WIN Magazine, the magazine of the American Association of Managing General Agents, just published an excellent article about the National Guard and the AJAH campaign for its 1.28 million readers. The author is Larry Ziemba, executive vice president of Phillips 66 and chairman of the Campaign Advisory Council. The article explains the tremendous opportunities for employers in hiring Guard members. Read the article here. Download the campaign flyer here. St. Louis, Mo., May 6, 2013 – Gross & Janes Co. has entered into an agreement to manage and operate two green crosstie processing facilities owned by Boatright Railroad Products in Montevallo and Clanton, Alabama. Under the agreement, Gross & Janes will process and pre-treat all green ties at both facilities with its patent pending, non-pressurized borate treatment, and Boatright will complete the tie processing with a creosote or copper napthenate pressurized treatment. Boatright will continue to purchase all green ties to be processed at both facilities. “We are very pleased to be able to draw upon Gross & Janes Co.’s 90 years of experience in green crosstie processing,” said Shane Boatright, Chairman and Chief Executive Officer of Boatright Companies, holding company for Boatright Railroad Products. “This is an exciting joint venture between two leaders in the railroad tie industry,” said Mike Pourney, President and Chief Executive Officer of Gross & Janes. Gross & Janes Co. is the largest independent supplier and shipper of untreated railroad crossties in North America. Founded in 1920, privately held Gross & Janes has processing facilities in Missouri, Mississippi, Arkansas and Texas. Boatright Companies, founded in 1989, includes a wide range of companies servicing both Class 1 and short line railroads throughout the United States and internationally. Hello, and welcome to all of you. Thank you for joining us. I am Buddy Downey, Vice President of U.S. Operations for Stella-Jones Corporation. I would like to take a minute and allow our guest to introduce themselves and state the organization they represent. 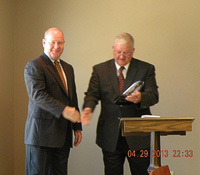 We at Stella-Jones including myself and Steve Basham and his team at the Winslow Division are excited to have the opportunity to visit with Congressman Bucshon and present this award. We are part of an industry that has a long history of providing the Nations Railways with the wood products needed to provide Rail Service to this Great Nation. We produce a wood railroad tie and other treated wood products for the railroads. Our product “The Wood Tie” is produced from the energy of the Sun and is a renewable, sustainable product that has a smaller carbon footprint than other competing railroad tie products. The Wood Tie has a bright future and therefore the employees at the Winslow Division have the opportunity to participate in that bright future. But for the Railroads to be successful and therefore Stella-Jones to be successful we must have strong leadership in Washington that understands the needs an infrastructure of our Great Railroads and the needs of heavy industry in general. Therefore we are here today to express our appreciation to Congressman Larry Bucshon, who is a recipient of the National Association of Manufacturers Award for Manufacturing Legislative Excellence. The Award goes to senators and representatives whose voting records on key manufacturing votes demonstrate an understanding of and support for the manufacturing sector’s vital role in our economy and our society. Before I go on, I would like to stress that this is not a campaign rally or a fundraiser, and this is in no way a political or campaign event. It is simply an opportunity for us to say “thank you” to Congressman Bucshon for his efforts in the 112th Congress. Larry Bucshon was raised in Kincaid, and attended the University of Illinois at Urbana-Champaign. Upon receiving his bachelor’s degree, he attended medical school at the University of Illinois at Chicago, then proceeded to complete his residency and fellowship at the Medical College of Wisconsin. During this time, Larry also enlisted with the United States Navy Reserve and served for almost a decade. Larry Bucshon ran for Congress in 2010 in the race to fill Indiana’s 8th District seat. He currently serves on the House Education & the Workforce Committee, Transportation and Infrastructure Committee, and Science, Space, and Technology Committee. His strong support of pro-manufacturing issues, such as energy and labor, earned him a stellar 97 percent voting record with the National Association of Manufactures during the 112th Congress. As we all know, what goes on in Washington has the potential to profoundly affect all of us here in Winslow, and that is never more true than on issues such as international trade, energy policy, taxes and regulations, among others. And it is why Congressman Bucshon’s votes in support of a pro-manufacturing legislative agenda are so important. All of us here today believe that manufacturers in America are critical to the strength of our nation’s economy. But the same cannot be said for all lawmakers in Washington, as we know from the amount of potentially damaging legislation that is proposed each year. We are lucky to have Congressman Larry Bucshon in our corner, advocating policies that will allow us to grow, create jobs, compete and stay ahead of our global competition. On behalf of the National Association of Manufactures, Stella-Jones Corporation, and our over 600 employees, it gives me great pleasure to present you with the National Association of Manufactures Award for Manufacturing Legislative Excellence. Thank you, Congressman Bucshon, for your courage and great work on our behalf. 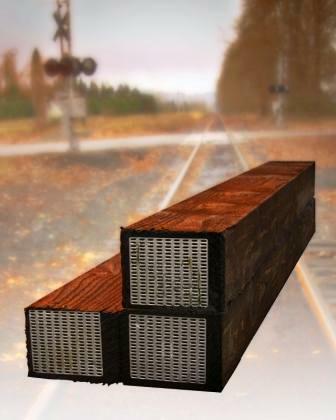 Creosote-treated wooden railroad crossties have been used for more than a century to support steel rails and to transfer load from the rails to the underlying ballast while keeping the rails at the correct gauge. As transportation engineers look for improved service life and environmental performance in railway systems, alternatives to the creosote-treated wooden crosstie are being considered. This paper compares the cradle-to-grave environmental life cycle assessment (LCA) results of creosote-treated wooden railroad crossties with the primary alternative products: concrete and plastic composite (P/C) crossties. This LCA includes a life cycle inventory (LCI) to catalogue the input and output data from crosstie manufacture, service life, and disposition, and a life cycle impact assessment (LCIA) to evaluate greenhouse gas (GHG) emissions, fossil fuel and water use, and emissions with the potential to cause acidification, smog, ecotoxic-ity, and eutrophication. Comparisons of the products are made at a functional unit of 1.61 kilometers (1.0 mile) of rail- road track per year. This LCA finds that the manufacture, use, and disposition of creosote-treated wooden railroad crossties offers lower fossil fuel and water use and lesser environmental impacts than competing products manufactured of concrete and P/C. To read the entire paper please click here. WASHINGTON – U.S. Transportation Secretary Ray LaHood today announced the availability of $474 million for a fifth round of the highly successful TIGER (Transportation Investment Generating Economic Recovery) competitive grant program to fund surface transportation projects that have a significant impact on the nation, a region or metropolitan area. Projects eligible for TIGER grants include highways and bridges, public transportation, passenger and freight rail transportation and marine port infrastructure investments. Grants may range in size from $10 million to $200 million. Grants to rural areas may be for less than $10 million, but must be more than $1 million. No less than $120 million must be awarded to projects in rural areas. The FY 2013 Appropriations Act requires that TIGER funds be obligated before October 1, 2014. The limited amount of time means the Department will give priority to projects that are ready to proceed quickly. In addition to project readiness, primary selection criteria include improving the condition of existing transportation facilities and systems; contributing to the economic competitiveness of the United States and creating and preserving jobs; increasing transportation choices and access to transportation services for people in communities across the U.S.; improving energy efficiency, reducing dependence on oil and reducing greenhouse gas emissions; and improving safety. Applications are due June 3. You can click here to view the Notice of Funding Availability. The EPA revised the NHSM rule on December 20, 2012 with some important improvements. The summary can be found here. April 19th, 2013 in Brewton, Alabama will be a day of educational opportunities. Arch Wood Protection, in conjunction with The Alabama Extension Service, Escambia County Extension Office, is sponsoring a Wood Preservation and Safety Course. Click here for more information and a detailed agenda. This course helps treaters maintain their CPAL certification in Alabama, and is open to anyone who would like to attend. There is no charge to attend. Contact Tim Carey if you are interested in attending. ASLRRA reported on January 2, 2013 that the 45G Infrastructure Tax Credit for Short Line railroads had been authorized retroactively for 2012 and extended for 2013. The 45G credit gives short lines a credit of 50 cents for every dollar invested in track rehabilitation, up to a credit cap equal to $3,500 times the railroad’s total track miles. The credit allows these railroads to maximize their investment in track rehabilitation and historically a huge portion of that work involves tie replacement. For RTA members this is a game changing piece of legislation for hardwood and softwood tie demand for 2013. Updated with this news, the RTA econometric tie demand forecasting model now suggests that at least 500,000 ties to as many as 1,200,000 million ties will be added to the market demand for 2013. This raises the total 2013 forecast for new wood tie demand to 23.3 million, on the low-end, to an upper-end of 24.0 million. This is an immediate positive for loggers, sawmills, and wood treaters. More importantly to note, for those RTA members who value the benefit of the 45G tax credit, is that work to keep the tax credit in effect past 2013 starts now. "With the 2012 election comes a new Congress with significant new challenges,” said RTA Executive Director Jim Gauntt. “There are 81 new Members of Congress very few of which will have any knowledge of or experience with the railroad industry. Likewise of the 255 co-sponsors of the just passed 45G legislation, 47 are now gone and will have to be replaced with new co-sponsors”. RTA leadership warmly received the news of this tax credit. CLEAR Committee Chairman Tom Niederberger of Koppers and RTA President Jeff Parrett praised ALSRRA's lobbying efforts and RTA staff for generating the data necessary to support industry efforts. "This is a win/win situation for RTA members", said Parrett, "and I echo staff's calls for more participation by members in support of our railroad associates — great job by all". Niederberger added, "Congratulations to RTA for the dedication and perseverance in support of ASLRRA and short line railroad legislative efforts". As a final reminder – Railroad Day-on-the-Hill is set for March 14, 2013 in Washington DC. All RTA members, as well as other timber industry member companies, are asked to join the effort this year. For more information please contact [email protected] or RTA staff at 770.460.5553 or visit the Events Calendar. The Railway Tie Association is excited to introduce a new service to our members. Potential buyers often contact RTA in an effort to reach producers and suppliers of new and used railroad crossties. You may now find those active requests on a new page of this website - the Bids & Industry Links page. We will keep the information on this page active as long as the buyers are still in the market for ties. You can check it out frequently and we will continue to alert producers of the requests as soon as they come in to the RTA headquarters. The 2012 Annual Conference in Tampa is now history. Thanks to everyone who participated and offered such positive comments. Find some Photos here. 2012 Tie Grading Seminar was outstanding! Please see the Tie Grading page for a photo and list of our 2012 Tie Grading Seminar winning students. Congratulations to the 2012-13 John Mabry Forestry Scholarship winners! RTA is delighted to announce that Joseph Szczepanski and Sam Tenneson have been awarded the two Railway Tie Association scholarships for the 2012-13 academic year. Joseph Szczepanski is a junior at the University of Wisconsin at Stevens Point (UWSP). He is the Activities Coordinator for the UWSP Society of American Foresters Student Chapter, tutors other students in diverse subjects, helps run a chainsaw safety course, and works hard on a cut-your-own Christmas tree farm among other things. Joseph hopes to use his education to balance the needs of the forest products industry with the need to sustain profitable and healthy forests. Sam Tenneson attends Humboldt State University in California and will begin his senior year this fall. Sam is a very active member of the Forestry Club at Humblodt State, the Society of American Foresters, the Humboldt State logging Team, the forestry honor society Xi Sigma Pi, and coaches the Arcata High Future Farmers of America Forestry Team. Sam plans to use his degree to be a competent steward of the land, managing forests so that they are both sustainable and profitable. The June 30th 2012 deadline for the 2012-2013 scholarship applications has passed. Look for the announcement in early part of 2013 for the 2013-1014 scholarship. The June 2012 trip to the Pacific Northwest was a great success. Thanks to all who helped in the planning and implementation of this event. Special thanks to Jerry Farley and Wayne Kusmierczyk for organizing the Field Trip. Photos will be up soon. Please enjoy the review & pictures of the 2011 Field Trip to Louisiana and Arkansas in the July/August issue of the Crossties magazine. A Production Trends Reporters' Forum is available to all RTA members. The Forum allows RTA members to view a running commentary with current, in-depth information on what is occurring in the marketplace regarding regional log availability, sawn hardwood product market conditions, and production. Members may access this information under Committees, Trend Reporters, Reporters' Forum. The current RTA Purchase Report reflects some changes we have made to include longer range effects of the latest trends. We have shifted the focus of the report to analyze annual and then quarterly data before reviewing the monthly data. In this way, the reader can view longer-term trends plus the monthly data in both text and graph format prior to moving to the data tab where all the information can be seen in significant detail. We hope that a clear picture of both long and short term trends will emerge. Quite a number of new studies have been added to the RTA-Sponsored Research page of this site. You may want to look over this literature in the Environmental, Historical, and Wood Preserving sections. RTA TieReports is a series of technical notes. These are condensed versions of RTA's most significant research on wood ties performance and wood preservation. The first 10 TieReports contain research on cost comparisons of alternative tie materials, the RTA Tie Usage Index, the environmental fate of creosote in wood tie track, wood preservation technology, and other timely topics. You can find all TieReports issues in our Online Publications section. National Salvage & Service Corporation (NSSC) of Bloomington, IN and TASKpro, LLC (TASKpro) of Starkville, MS have entered into a long term agreement to research, develop and implement supplemental treatments for railroad crossties. NSSC and TASKpro will utilize TASKpro’s xxtraBOR™ Wood Treatment System to maximize the life of in-track and recycled crossties by utilizing proven technology to arrest incipient decay, reduce the spread of invasive species (i.e. Formosan subterranean termite, emerald ash borer) and minimize “spike” kill associated with the interface of wood and mild steel. NSSC the largest recycler of used crossties in North America and TASKpro a leading research and development company for wood protection systems, will leverage their expertise to offer the first all-inclusive supplemental treatment system for in-track and post-use crossties. St. Louis, Mo., May 31, 2012 -- Gross & Janes Co. has introduced its new borate pre-treated crosstie called Tuff-Tie™ to the railroad industry. This new green crosstie is treated with borate using an innovative non-pressurized process prior to drying and shipping to the customer for creosote treatment. This ‘two-step’ treatment process eliminates the cost of pressurized application of borate at the time of creosote application, while also offsetting the amount of oil-based creosote needed for tie protection. The result is a lower-cost tie with enhanced environmental benefits including less creosote utilization and more environmentally friendly alternatives for the disposal of spent ties. Tuff-Tie™ production is now taking place at a railroad crosstie production facility in Taylor, Arkansas, which Gross & Janes acquired in January 2012. Approximately 6 percent of the 22 million railroad ties made in North America last year were treated with borate. Gross & Janes was an early railroad industry proponent of using borate to offset creosote utilization in the production of crossties. Gross & Janes Co. is the largest independent supplier and shipper of untreated railroad crossties in North America. Founded in 1920, privately held Gross & Janes has processing facilities in Missouri, Mississippi, Arkansas and Texas. The company serves Class 1 railroads and track maintenance contractors with high quality green and borate pre-treated crossties, and purchases raw material from more than 225 independent sawmills located in ten states. Koppers Roanoke facility is the recipient of the Virginia Water Environmental Association's (VWEA) 2012 Industrial Waste and Pretreatment Environmental Excellence Award in the Silver category. The award "recognizes outstanding industries throughout the state of Virginia for their hard work and dedication to protecting the environment," according to the award notice sent to Plant Manager Tim Ries. Water authorities throughout Virginia are asked every year to identify and nominate industries that have consistently achieved 100 percent compliance with the requirements of their pretreatment permits, and demonstrated dedication and commitment to pollution prevention, waste elimination/reduction or conservation through the implementation of an Environmental Management System. Tim said the employees at the Roanoke facility are very proud of receiving the award because of what it represents.nominated Koppers to receive the 2012 Award in the Silver category. "How we manage priorities such as compliance and environmental protection is a demonstra­tion of what is important to the people who work for Koppers," he said. "We take these issues and priorities very seriously." The award was given out as part of VWEA's Industrial Waste and Pretreatment Seminar held annually for municipal and industrial environmental staff, pretreatment engineers and operators, and environmental compliance managers and consultants. Jason Fiore (Treating Supervisor), and Charlie Pratt (Waste Water Operator) were in attendance at the awards presentation in Charlottesville, Virginia in early March to accept the honor on behalf of the entire Roanoke facility. Tim said the employees at the Roanoke facility are very proud of receiving the award because of what it represents. The award was given out as part of the WWEA's Industrial Waste and Pretreatment Senubar held annually for municipal and industrial environmental staff, pretreatment engineers and operators, and environmental compliance. January 2012- Gross & Janes Co. will supply its new borate pre-treated railroad crossties to the Kansas City Southern Railway Company (KCS) under a contract signed by the two companies recently and set to go into effect in early 2012. This is the first major railroad company to purchase crossties utilizing Gross & Janes' innovative new borate pre-treatment method. The crossties represent a substantial portion of KCS's overall tie needs over the next three years. "We are grateful that KCS sees the added value that our new non-pressurized borate pre-treatment process delivers to their operations," said Mike Pourney, President and Chief Executive Officer of Gross & janes. "They are the first major railroad company to have confidence in this new process and in our ability to provide a consistent quality and supply of these new ties. We hope to make a long-term positive impact on their infrastructure." St. Louis, Mo., January 11, 2012 – Gross & Janes Co. has acquired a railroad crosstie production facility in Taylor, Arkansas and approximately 4,200 acres of hardwood timber in Arkansas and Louisiana from Tucker Lumber Company and Smith-Turner Land Company. Terms of the deal, which was completed on January 9, 2012, were not disclosed. The Taylor plant will be used to process approximately 400,000 ties annually, with a large portion of those being pre-treated with borate to fulfill customer demand. “This is a good fit for both parties,” said A. Lamar Smith, a co-owner of Tucker Lumber Company and Smith-Turner Land Company along with John Turner. Gross & Janes is the largest independent supplier and shipper of untreated railroad ties in North America. December 7, 2011- Stella-Jones announced it has completed the acquisition of Thompson Industries, Inc., a provider of treated wood productes to the railroad industry. Founded in 1981, Thompson produces treated wood products, mainly railway ties and timbers, at a facility located in Russellville, Arkansas. "The acquisition of Thompson further enhances Stella-Jones' status as a leading provider of treated wood products and services to the North American railroad industry. More importantly, we expect the transactionto be immediately accretive to earnings and to yeild synergies, as our continental network will benefit from greater operating efficiencies," said Brian McManus, President and Chief Executive Officer of Stella-Jones. Gross & Janes Co. has moved its headquarters into a historic, 135-year-old building by the railroad tracks in downtown Kirkwood, Missouri. They now occupy approximately 2,800 square feet of newly renovated office space at 157 W. Argonne Avenue, across the street from the historic Kirkwood Train Station. The company has a rich, 90-year relationship serving the nation’s railroad industry and this new location perfectly reflects its culture and future. This new space also gives room to grow as the business and employment bases are on track to increase by 20 percent this year. To commemorate the move to Kirkwood, Gross & Janes has planned an Open House event on October 27th to include a tour and a reception at the nearby Kirkwood Train Station. Visitors will also have an opportunity to meet one-on-one with Dr. Jeff Lloyd, of Nisus Corporation, and Dr. Adam Taylor, from the University of Tennessee, to learn more about their new borate treatment process for crossties. This news came from Susan Bunnell who is based in Wilbraham, MA, one of the nine communities in western Massachusetts that were certified as FEMA disaster areas after the June 1st tornado. "One of the foresters to whom I've spoken indicated that there are 2500 acres of private, non-industrial land and 1000 acres in the Brimfield State Forest that were devastated by this storm. Although many of the trees were twisted, snapped, and broken off, countless others are blow down and many still have a section of the root ball in the ground, a condition that will maintain their viability for repurposing perhaps into the next growing season. "I have been actively engaged in formulating an effort to recover and repurpose much of this material to its highest, best use. As I work to secure financial support for the project, the market for railroad ties surfaced as a valuable secondary market. As a test case to launch the effort, I have been given "right of first refusal" on 1100 trees that a municipality is removing from within 100 feet of some waterways. There are at least 100 red oaks that should be viable for the railroad tie market. In addition, I have already engaged with several private homeowners who have multiple trees of significant size, e.g. 25-30 on one property, close to road and on flat ground, averaging 18" in diameter, The majority of those are also red oak. I am interested in speaking with someone about a range of possibilities, from selling the logs to selling green ties. I may be reached via email at [email protected] or on my cell 413-218-8442." Robert J. Baeppler has joined Arch Wood Protection, Inc. as Business Manager, Chemonite® Products. He will be responsible for overseeing the marketing, sales, and development of ACZA (Ammoniacal Copper Zinc Arsenate) preservative. Prior to his new post, Bob spent 35 years in wood preservation, encompassing plant operations, procurement, management, training, and sales for various companies including Forest Products Research Laboratory, McFarland Cascade, T. R. Miller Mill, Applied Research, and International Paper. He holds a B.S. in Forest Industries from Ohio State University, and is an advisor to the executive committee of the American Wood Protection Association. Arch Wood Protection, Inc. is a leader in wood treating technology. Among its products is ACZA preservative, sold under the Chemonite® brand. ACZA treatment is noteworthy for its protection of Douglas fir and other hard-to-treat species and is used most commonly for marine piling, utility poles, lagging, fence posts, and heavy duty applications. Long-established in AWPA standards, ACZA-treated Doug fir is generating new interest as railroad ties and guardrail posts. June 16, 2011. It had appeared that the EPA registrations for copper naphthenate products were going to disappear. With that disappearance, wood treaters would have suffered the loss of a product that has been one of the greenest and most effective wood preservatives available in the pressure treatment market. It is the only oil-borne ground contact wood preservative that is not a restricted-use pesticide. Many in the industry knew what a loss this would be to wood protection. Well-known industry experts Mike Freeman, Jim Brient, and Gerald Davis - now independent consultants, joined with Dr. Jeff Lloyd, Vice President of Research and Development at Nisus Corporation, to determine what action to take. Freeman had initially approached Dr. Lloyd by suggesting that because Nisus is recognized in the industry for its borate-based green technology, copper naphthenate would be a natural addition to its wood preservation product line. According to Dr. Lloyd, “If the industry lost this product, it would immediately result in an increase in the use of non-wood alternatives and have a long-term detrimental effect on our industry and the environment. ” Dr. Lloyd briefed Nisus President/CEO Kevin L. Kirkland, who assembled a team that has worked relentlessly for two months to see if the situation could be salvaged – and then went himself to visit EPA. At issue was a large and very expensive Data Call-In (DCI) from EPA from June 2010 that none of the current registrants was prepared to support. Nisus, working with EPA, has now agreed to meet these requirements and is submitting a registration for copper naphthenate. The EPA recognizes what is at stake for the user community and the environment. Moreover, EPA management has indicated they will process the Nisus applications expeditiously so that there is not an interruption in the supply of registered copper naphthenate. QNAP1W RTU Copper Naphthenate Ð a water-based 1% Cu active, tintable formulation, to be used by sub-registrants who support the remedial, end-cut and retail markets. Elaina Jackson of Pacific Wood Preserving said, "Copper naphthenate is a great wood preservative that we have used for many years. Now that Nisus is producing and marketing copper naphthenate, we know that their customers will receive a high quality product delivered professionally and personally. They not only care about their business, they care about their customers. It's an unbeatable combination." Nisus has just completed its first successful production test and will be taking pre-orders for products by the end of June 2011. The products will be produced at the company's Rockford, TN plant. Boston, MA—June 2011. Ze-gen, Inc., a leading developer and integrator of advanced gasification technology to convert waste streams into synthesis gas (syngas), is pleased to announce the completion of a 30-day continuous trial at the company’s New Bedford Demonstration Facility. The purpose of the longer continuous runs is to demonstrate the operational viability of Ze-gen’s Liquid Metal Gasification (LMG) process. This is the second time since Phase II testing began in September 2009 that Ze-gen has conducted a long-term continuous run trial, and the completion of this test brings the facility to over 4200 hours of cumulative run-time. During this most recent 30-day test, Ze-gen experienced 90% up-time, which means the gasifier was converting waste wooden railroad ties into a high-quality, tar-free syngas for 90% of the time operating. The other 10% of the time was spent on slagging, operational adjustments, and minor maintenance. Slagging is the process of removing the inorganic constituents of the feedstock from the liquid metal bath of the gasification vessel. The slag is a recyclable byproduct that is non-leachable and can be used as an aggregate for construction. All air and solid waste permit limitations were met throughout the trial. The 90% operational time exceeded Ze-gen’s goal of 80%, which helps to further prove the commercial potential of Ze-gen’s LMG technology. The 30-day operational test run using ground, discarded wooden railroad ties is an example of how Ze-gen’s facilities offer an environmentally beneficial disposal alternative to landfilling and incineration. Discarded railroad ties represent waste materials that are difficult to dispose of in an environmentally responsible fashion because they are bulky and contain creosote preservatives. Ze-gen’s ability to process, thermo-chemically destroy, and thus beneficially reuse creosote-treated crossties in an environmentally sound manner presents an excellent alternative to landfilling this material. Because the New Bedford facility is a pilot plant, the syngas generated is not used to generate electricity. The LMG process’s performance and emissions are continuously monitored for R&D and reporting purposes. The process produces a high-quality, tar-free syngas and the 30-day continuous run helps to further demonstrate how Ze-gen’s LMG process can offer facilities seeking to reduce their fossil fuel use a reliable and continuous source of renewable fuel. The Executive Committee of the American Wood Protection Association (AWPA) gave final approval for listing of ACZA-treated Douglas fir railroad ties in the AWPA Book of Standards. Ammoniacal Copper Zinc Arsenate (ACZA) has been listed in AWPA standards since 1983 as an accepted wood preservative but it was not listed for the protection of ties. Recent pressures on creosote treated ties led Arch Wood Protection, Inc., licensor of the Chemonite brand of ACZA-treated wood, to submit test data to AWPA membership for tie applications. The data package was submitted to an AWPA technical committee and its positive reaction was sent to the general membership which voted in favor of the listing. AWPA is a consensus organization that establishes standards for the wood preserving industry. Its membership consists of preservative manufacturers, treaters, users of treated wood, scientists, academics, and other interested parties. According to Arch Wood Protection, Inc., ACZA preservative has proven its value in heavy duty applications. For example, Douglas fir is a strong, plentiful species – well-suited for use as ties – but not readily treated with other preservatives. Tests of ACZA-treated ties have shown low corrosivity and excellent spike-holding characteristics. The preservative enables wood to resist termite damage and fungal decay and has been found to reduce flame spread in wood timbers. The new wood preservation section of the Nisus website is up and running as of January 20, 2012. To access the site, go to the Nisus home page and click on "Wood Preservation" in the center of the page or access it directly here. CHESTERFIELD, MO – July 30, 2013 – MiTek Industries (MiTek), a Berkshire Hathaway company (NYSE: BRK-A, NYSE: BRK-B), and the world’s leading supplier of advanced engineered structural connector systems, equipment, software and services for the building components industry announced today that it has acquired Benson Industries, LLC. Benson is the global leader in the design, pre-fabrication and installation of custom unitized curtain wall systems for high-end commercial, hotel, residential, governmental, and institutional buildings worldwide. MiTek is a subsidiary of Warren Buffett’s Berkshire Hathaway Inc.